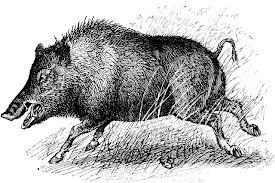 It occurred to me after I wrote the post about wild boar that maybe I should go back to basics a bit and talk about meat in general. 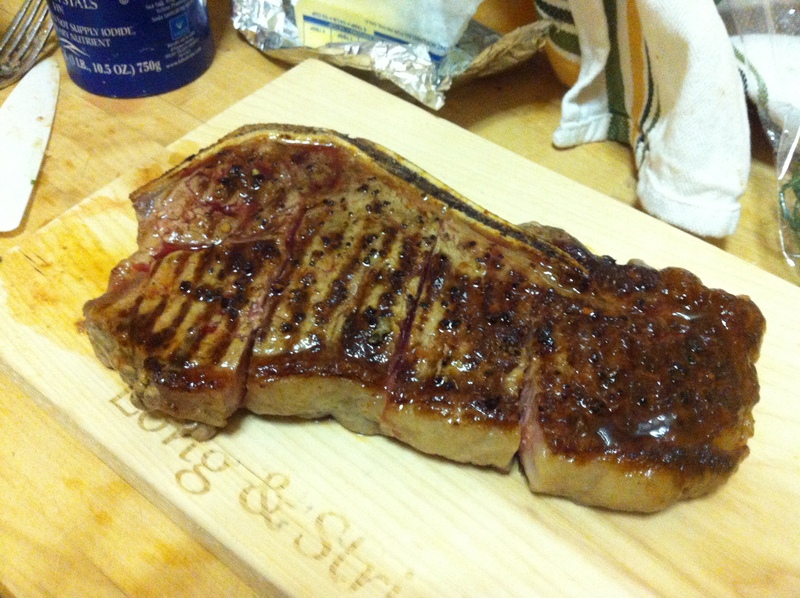 Also I had in my freezer a bone-in New York strip steak that weighed just over a pound. 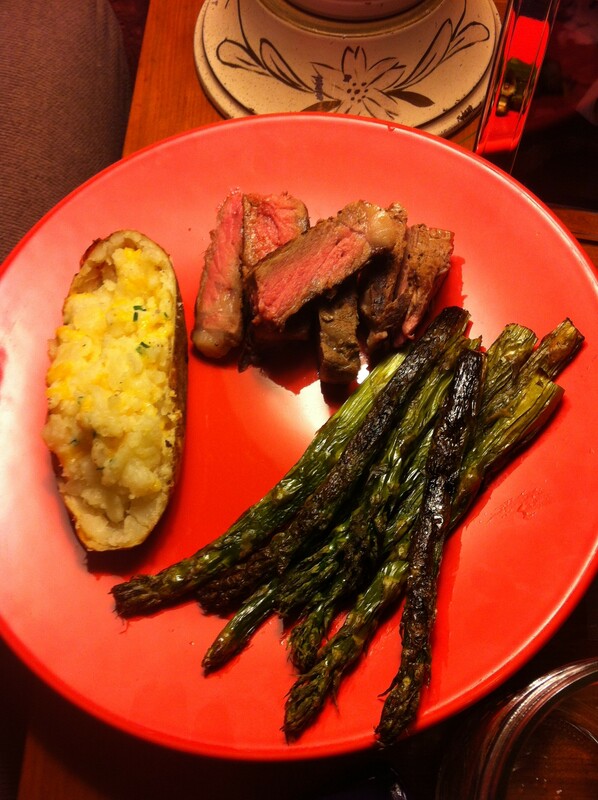 Figuring out what a good steak looks like is fairly simple. For example, this is a decent steak, it has nice, tight marbling, it’s meaty, the fat is trimmed but it’s still on there (Remember people: Fat is flavor.) Marbling by the way are thin fibers of fat that run through a cut of meat, the more delicate the marbling, the more buttery and delicious the flavor. Oh, also, select is the lowest grade, then you have choice, and prime. Because my mom owns a meat market, I don’t often eat anything but prime. But the average person can get a good choice steak and it will be delicious. Just be aware of this, so when steak goes on sale and some insanely cheap price like $3.99 a pound, know you’re probably getting the lowest quality. There’s no such thing as free lunch and all that jazz. I don’t have a grill, or a backyard for that matter, so I have to get creative about how to cook steak. My mom bought me a cast iron grill pan and I recommend it for anyone lacking in the outdoor department. If a steak is good, it doesn’t need much. A little salt, a little pepper, rub a handful of olive oil on there and that’s it. I have this spice, called Chicago steak and chop and it’s ace but not sure it’s sold everywhere. I prefer my steak rare, or medium rare at best. Ok so, this applies for a grill or a grill pan, either one: Get it hot. You know it’s hot when you flick water onto it and it sizzles. With an 1.5-inch steak, my mom said that it would take about 7 minutes per side. . For a more well-cooked steak, try 8-10 minutes. Don’t screw around with it when it’s on the grill, let it sizzle on a side and then flip it over. That way you can get nice grill marks. Let it rest for a few minutes after you cook it, maybe while you’re making the double-bakes below. 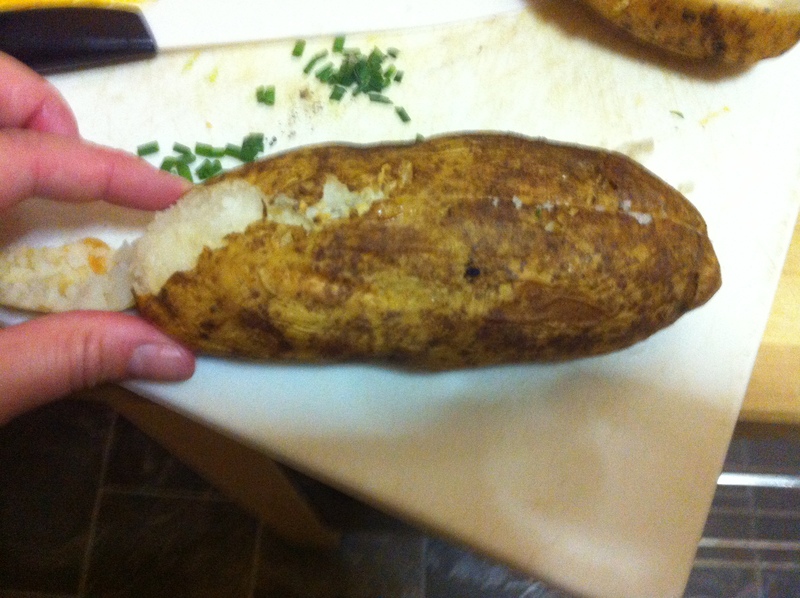 I also made a quick double-baked potato for dinner, which is another one of those staples that tends to escape people. It’s super easy. You rub olive oil and salt on an Idaho potato and bake it for an hour. 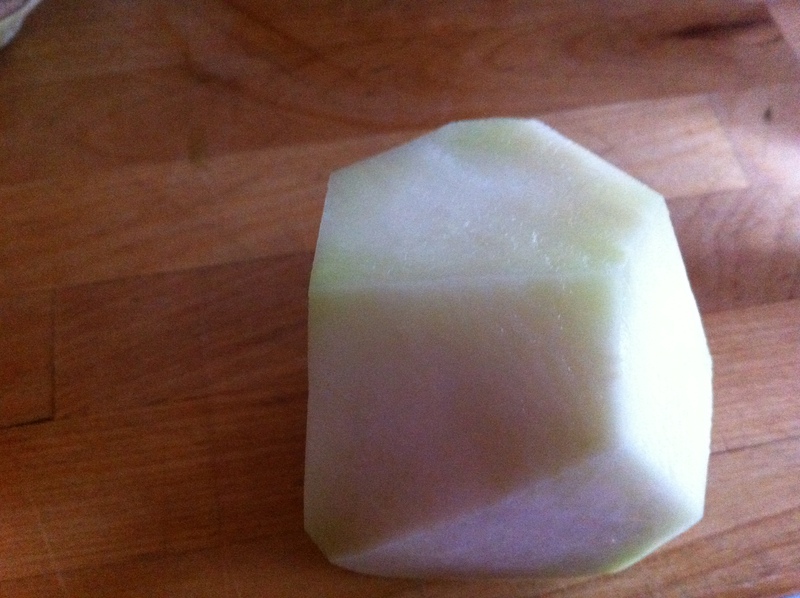 Then take it out and slice it in half, and scoop out the potato innards. By the way it will be H-O-T so be careful. 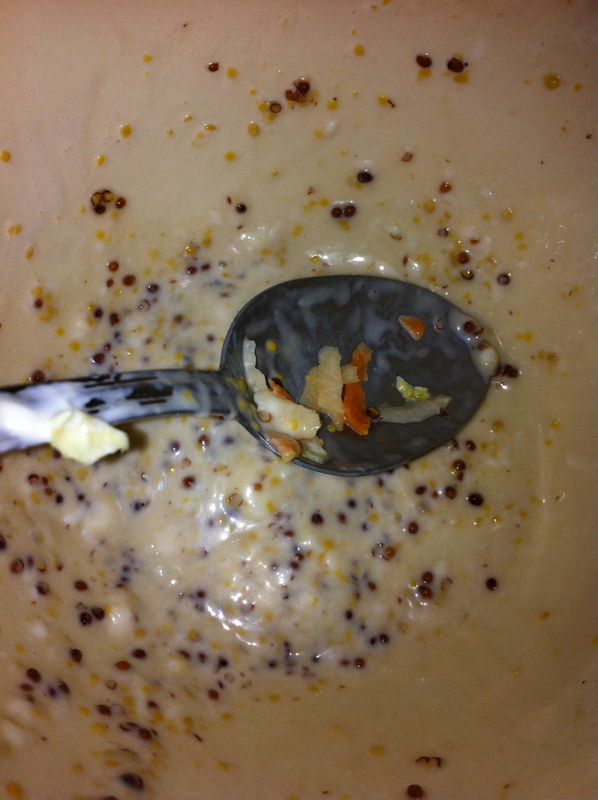 Ok so then, throw the innards in a bowl with two splashes of milk, salt, pepper, and small chunk of butter. 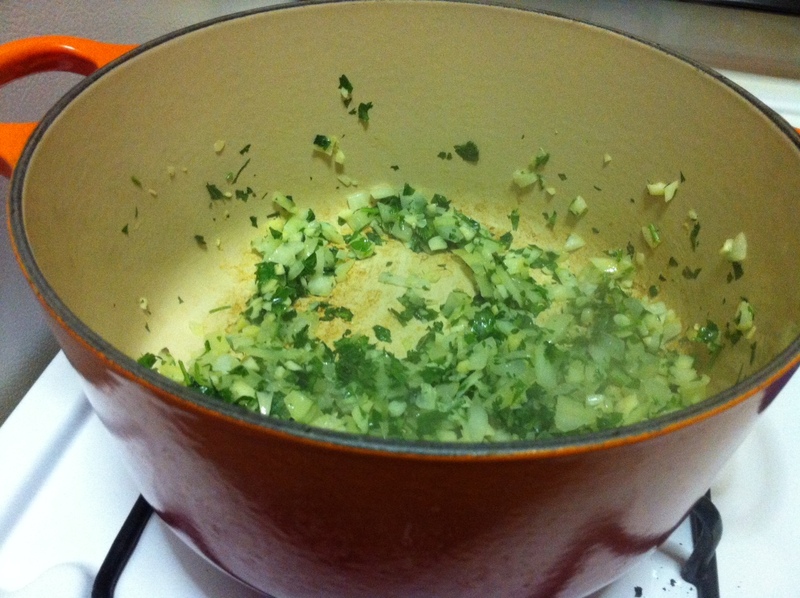 Throw in two handfuls of grated sharp cheddar cheese, and a handful of diced chives or scallion. Mix this up and then scoop it back into the potato, and stick it in the oven again for just as long as it takes you to slice the steak. That way the cheese is full melty goodness. I also roasted some asparagus with just a hint of olive oil and a dash of salt. 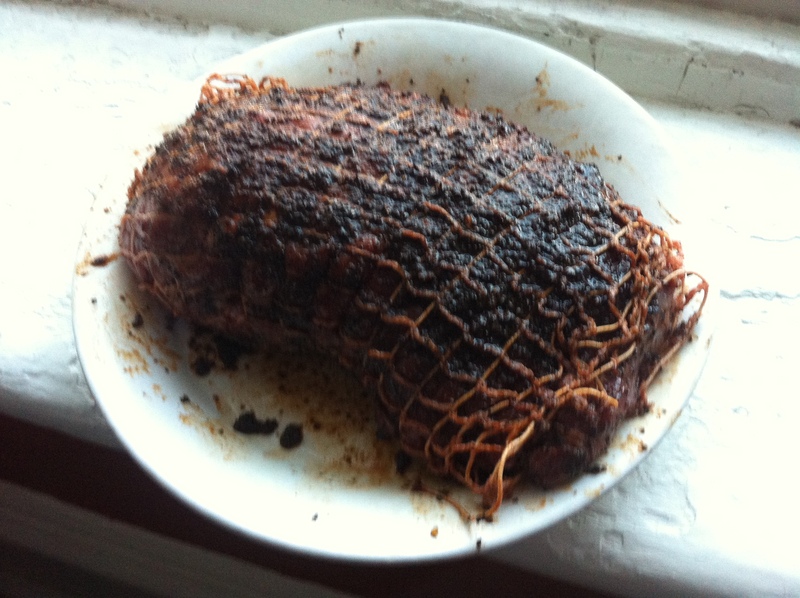 Andrew came home one day with two pounds of wild boar. I doubt this is a regular occurrence for most people. It came as a surprise to me, too. I’ve never had wild boar before and I had no clue what to do with it. But now I do, and I thought maybe there are others out there with roasts in their freezers scared of tackling them. Ok. Fair enough. My mom said that I should put a rub on it, then make a marinade and baste it every 15 minutes or so, because wild boar has less fat and can get dry, fast. The idea of the rub-marinade combo is that you seal in juices and slow-cook it to get a good flavor. Rub the rub all over the meat, and then let it sit for an hour at least. Heat the oven to 325. 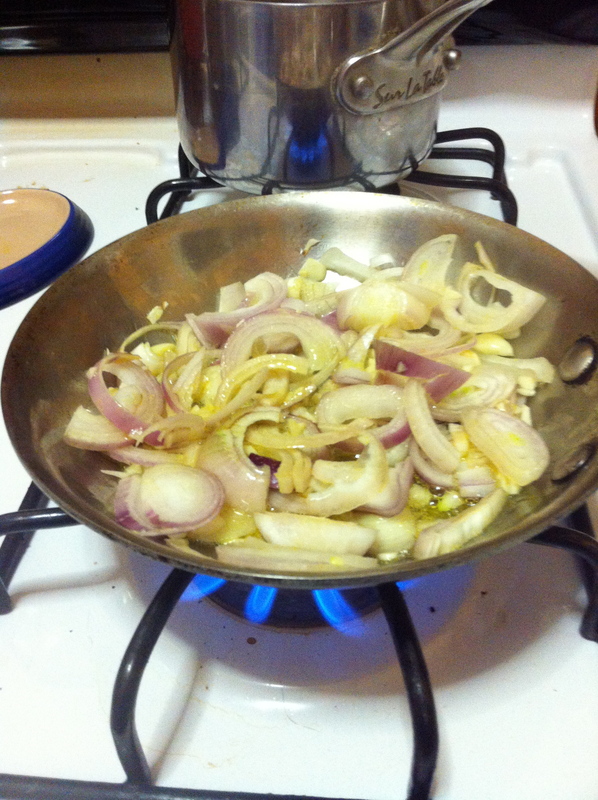 I sautéed the shallots, ginger and garlic together 2 table spoons of olive oil to caramelize. I added them to the liquid. I put the roast in the pan with the marinade and stuck it in the oven and slow cooked it. Probably 15-20 minutes per pound, but at slower heat you cook it longer. I basted every 15 minutes, which means I took a spoon and I drizzled the pan juices all over the top. It turned out really well. 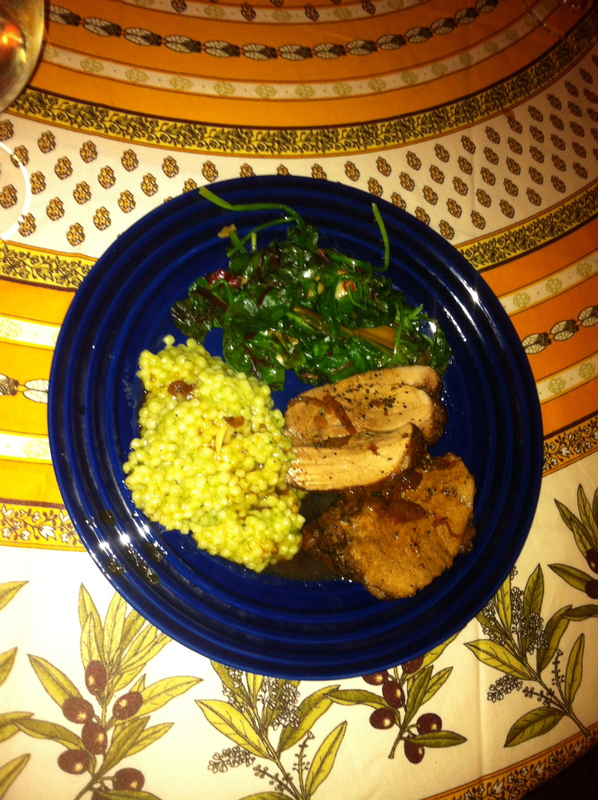 Boar is a little gamier than a regular pork roast but it has a nice robust flavor and everyone seemed to enjoy it. Sooo, go get some and try it! When I used to work at my mom’s store, I had to make loads of this dish called chicken dijon. 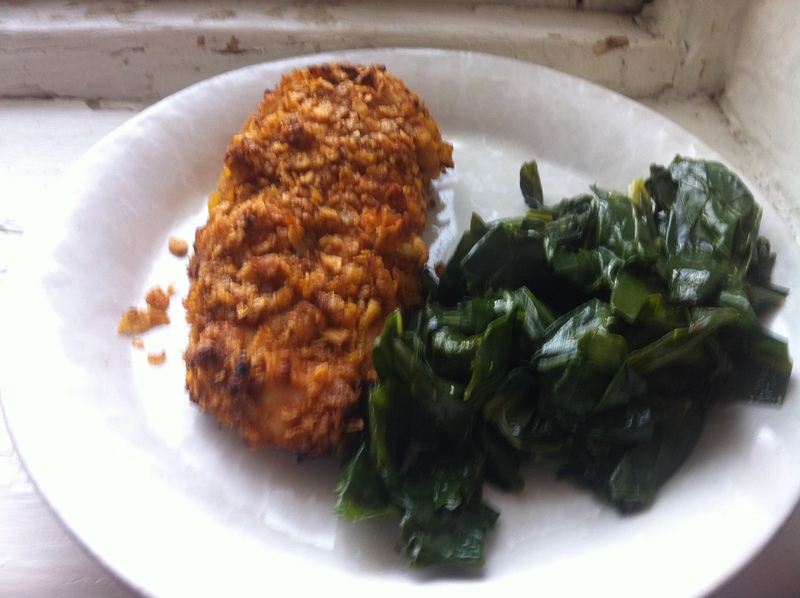 Essentially, it’s a chicken breast coated in butter and mustard, then dipped in breadcrumb goodness. 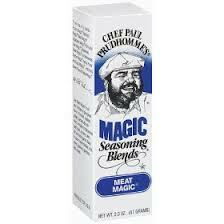 The downside is you get this sticky mix all over your hands, and I made so much of it that my fingers would smell like garlic and mustard for days. I still can’t deal with making it , so you’ll have to ask her how. 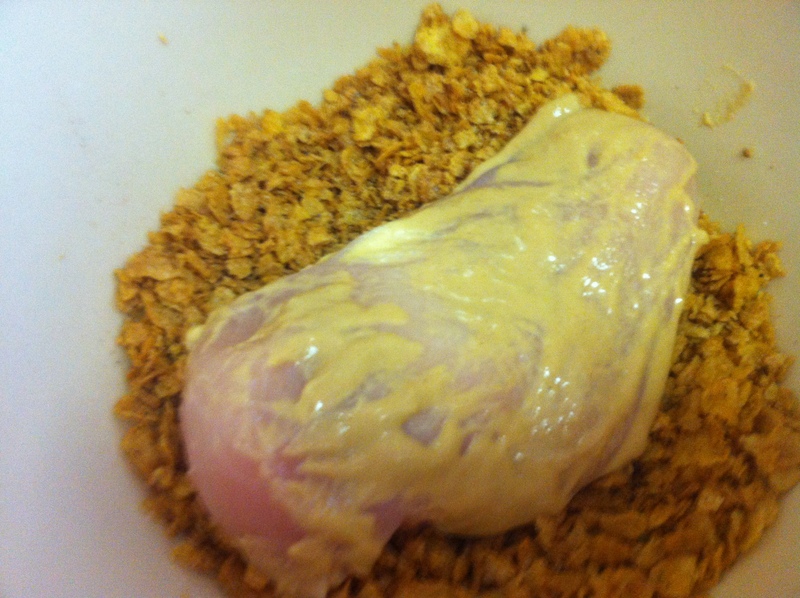 But I really like the principle of the dish, especially the dijon which gives the chicken breast a juiciness when they tend to get really dry, really fast. This serves 2, so double it for 4. 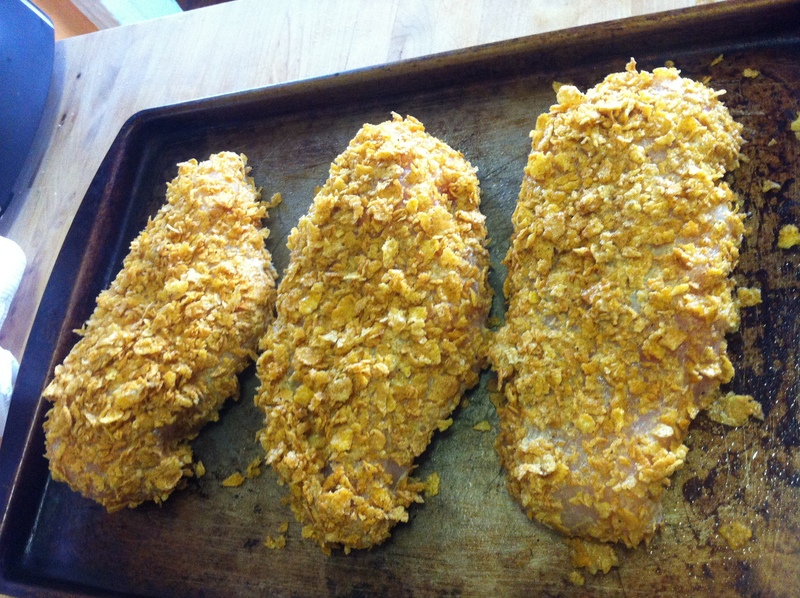 Ok so, put about 1/2 the jar of dijon into one bowl, and then in a second bowl, crunch up the corn flakes and add salt, pepper and a few shakes of that meat magic spice (or whatever kind of spice you want, really.) Plus 2 tables spoons of olive oil. 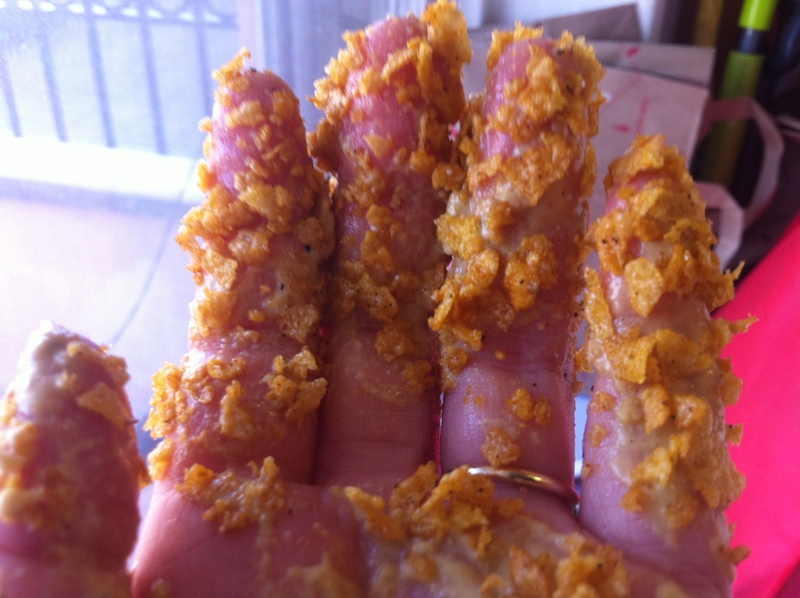 I would use tongs, otherwise this happens, and it feels gross! Then let them cook at about 400 for 45 minutes. I wouldn’t turn them over because the bottom has a tendency to come off in the oven, unless you’re a real pro. 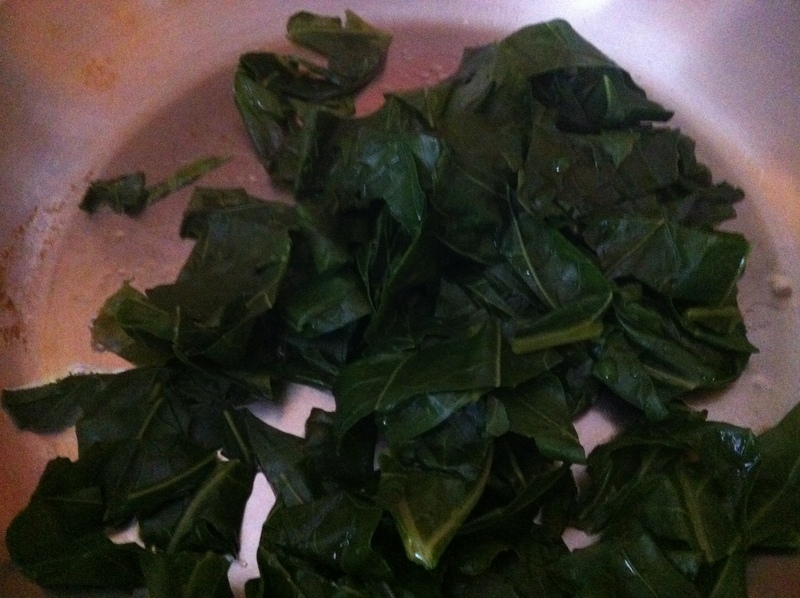 Meanwhile, I made collard greens. So you need to cut out the spine because it’s awful thick. Then slice them in long lines, and boil them for 10 minutes to soften them up. When the chicken is 10 minutes from done, you sautee the greens for 10 minutes, splash a tablespoon or two of vinegar and a little garlic and oil. Hello out there. I’ve been desperately remiss here about posting, and it’s not because I haven’t asked my mom for advice. 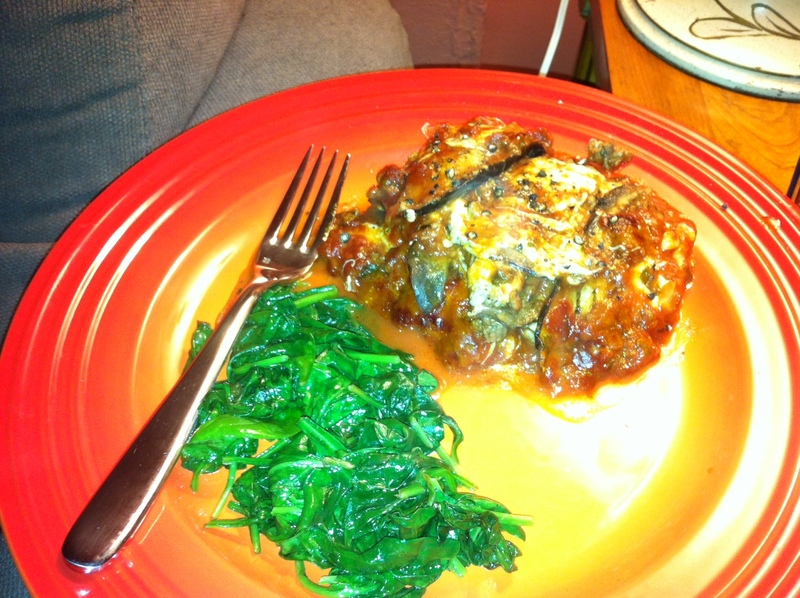 So I am attempting to start anew, and I have just the thing, because I just ate it and it was really good: grilled, not fried, eggplant parmesan. 1 oven pan, 9-13 or something like it. O.k. 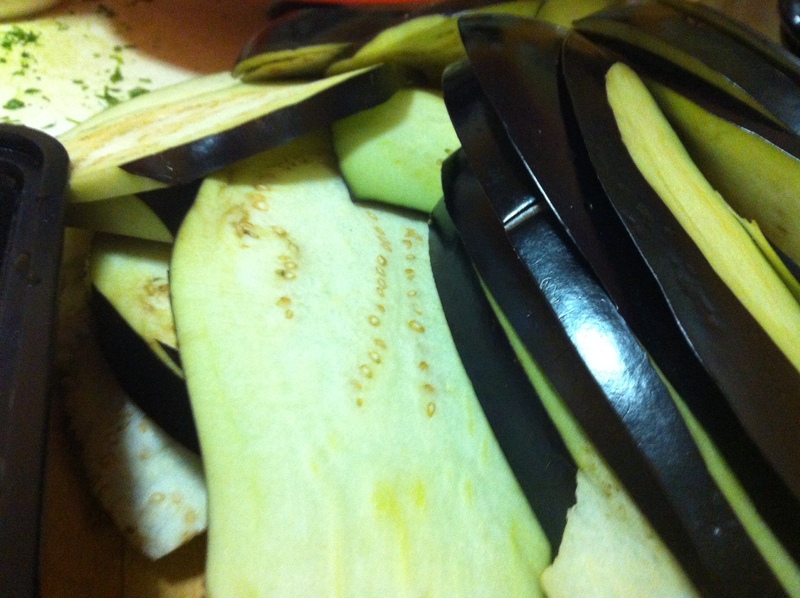 so, slice the eggplant long ways in half, and then thinly. Brown 1 pound of ground beef in a saute pan, then drain grease and set aside. Dice parsley, olive and onion, and add to sauce pan with olive oil. Toss the ground beef in the pan, then add the canned tomatoes, and about 1/2 can of water per can of tomato. Salt and pepper to taste. Stir. Let it boil, then simmer for about 20 minutes. Meanwhile. If you have a grill, do this on the grill, if you have a grill pan, do it on the grill pan. 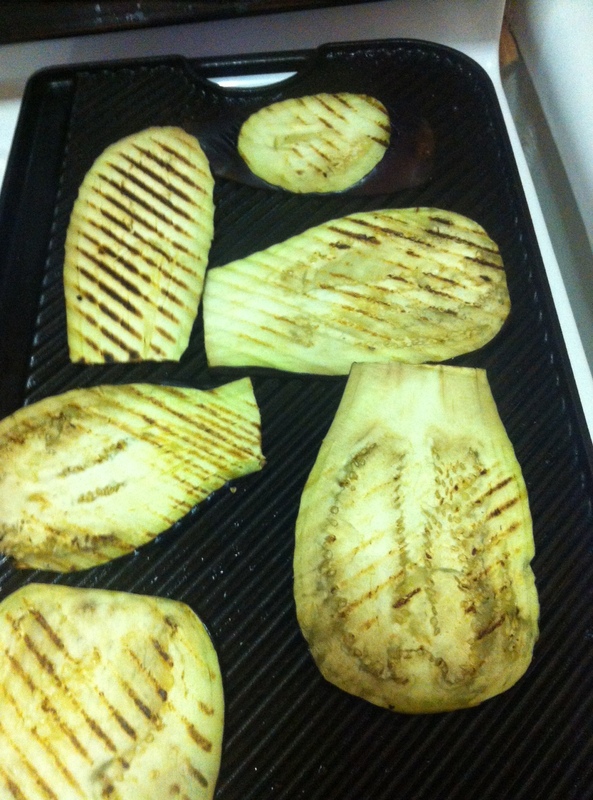 Brush a thin layer of olive oil over the eggplant, (seriously, thin, you shouldn’t drench it) and grill them so they are soft in the middle. This process took me about 20 minutes. 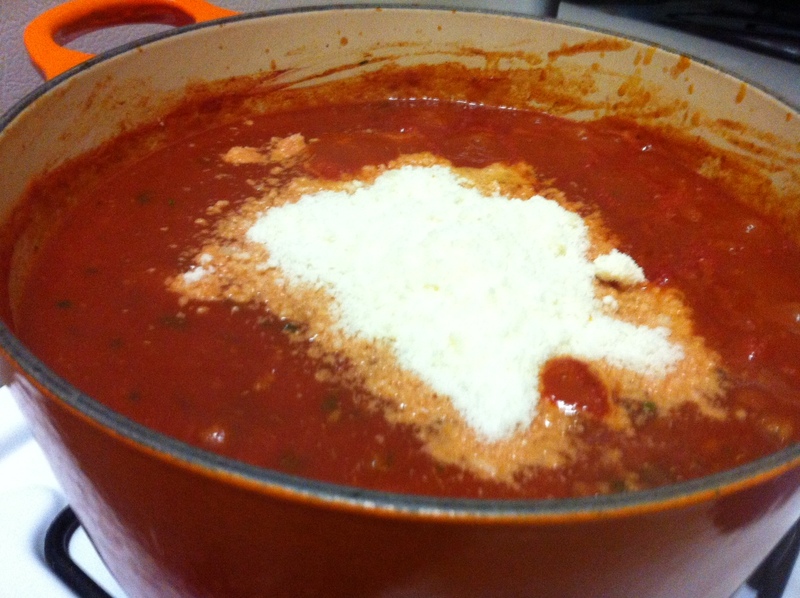 After I was done, I added about four fistfulls of cheese to the quick red sauce and turned that off. Slice the fresh mozzarella. And then layer! Eggplant, cheese, sauce, until you run out of room in your pan. Sprinkle a layer of parmesan on the top. Bake it longer than you would normally bake fried eggplant, like 40 minutes at 350, covered for 3/4 of the time. Take out and eat! We had plain sautéed spinach as a side. It was good. And not so bad for you! I got fresh fava beans this week. Hannibal Lecter likes to eat his with liver and a nice Chianti, but frankly I can’t stand the consistency of organ meat, so we settled instead on red snapper, which I’ll explain below. 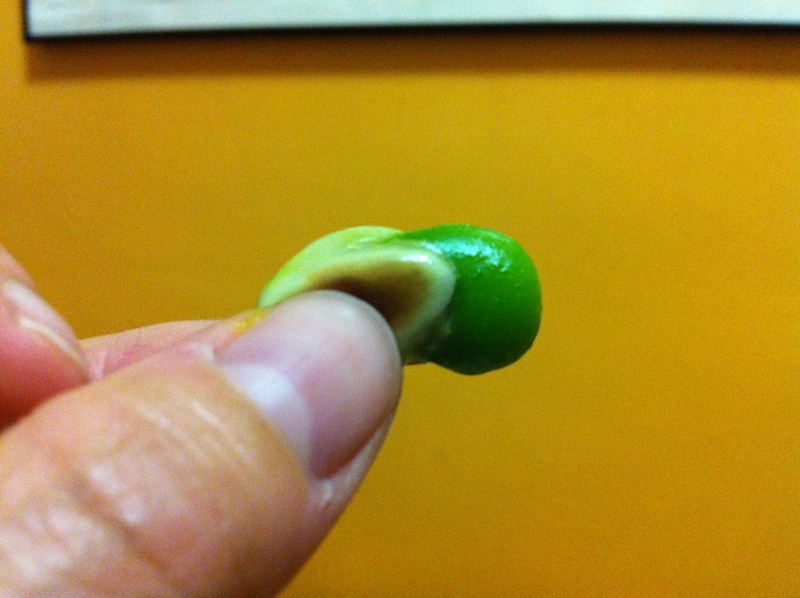 Turns out, fava beans are a lot of work for little yield. 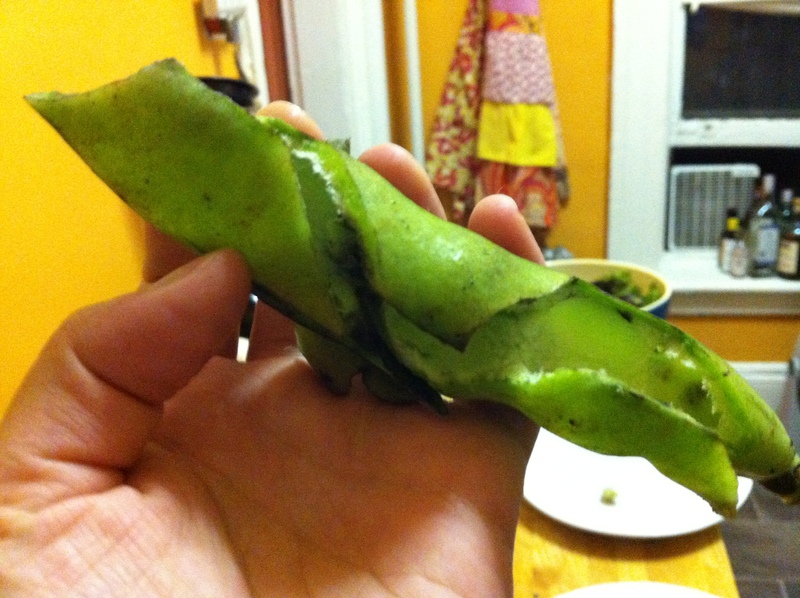 You have to remove the beans from the pod, then on remove the beans from a little white sheath. We had a big handful and ended up with just a tiny amount. 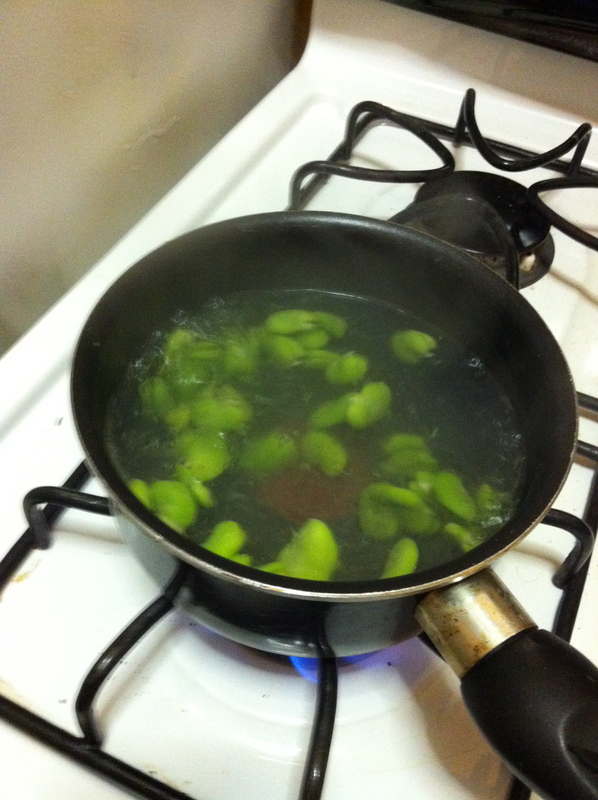 The beans are tough, so my mom suggested to first blanche them, which essentially means to drop them into hot water with salt just before it boils, then leave them in about 2-5 minutes, until the beans turn bright green, then drain them and shock them in a bowl of cold water. This method works well on just about any green veg, and you can leave them in a little longer if you want a more cooked vegetable with a retained crunch. 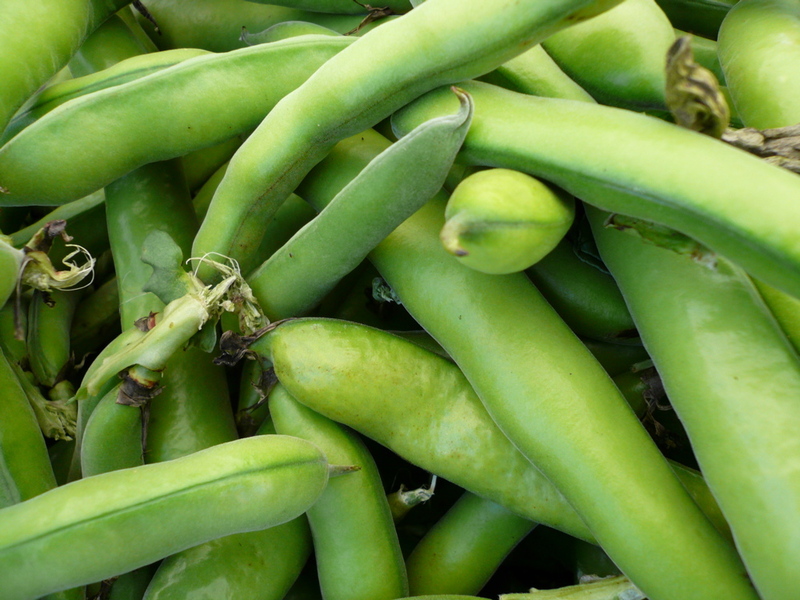 I didn’t end up with a lot of beans so I also blanched some fresh English peas I had lying around. Meanwhile, I heated up 2 tablespoons of olive oil and 2 cloves fresh garlic, diced, and sautéed the favas for a few minutes until they were on the crunchy side, then I threw in the peas right at the end to warm them. It also happens to be fresh fig season, which I’ll write about in more detail later. 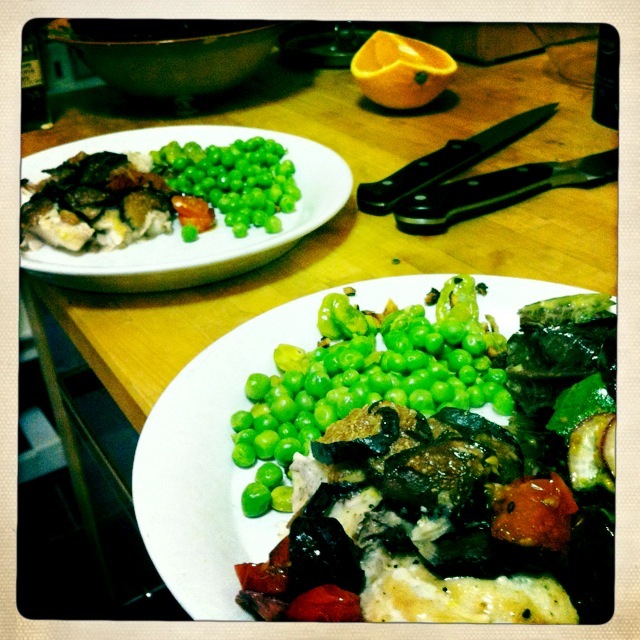 But I had a package going bad in my fridge, so I chopped them up and threw them on top of a filet of red snapper that had been smeared with a table spoon of olive oil, salt and pepper. I broiled it for about 10-15 minutes, then squeezed on some fresh lemon. Not bad, and also not criminal. Andrew did bring Chianti home for dinner, though. Clariiiiicceeeeee …. My friend Jenna and I are splitting a share this summer of what’s known in New York as “CSA.” It stands for community-supported agriculture, and I’d never heard of it before moving here so forgive me if I’m explaining something that everyone already knows. You pay up front and then get 25 weeks of surprise vegetables and 22 weeks of fruit delivered to a spot near you from farms upstate. In Brooklyn there is no shortage of organic, farm-fresh vegetables. Or really of anything artisanal or niche (New York Magazine said with its usual snark that it’s a borough pretending it’s a 19th century English village, and that pretty much nailed it.) But the benefit of the CSA is the surprise factor. At a farmer’s market, you’re still going to step away from the strange-looking root and choose a more familiar edible. With CSA you have no choice. Jenna picked up the batch this week and was so excited about this root vegetable I’d never heard of that she traded for two so we could each have a bunch. I called my mom, but shockingly, she was little help. The only thing she said was: “I like it, therefore you should, too.” Oh, and she told me to peel it. To end the suspense, it tastes sort of like a mild broccoli with the consistency in-between a turnip and a crisp apple. 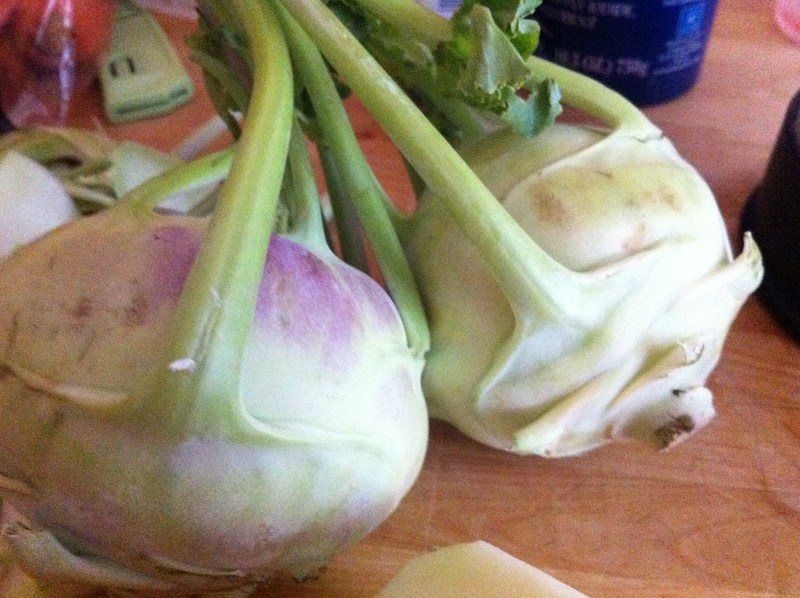 Thanks to the delivery this week I also had a giant head of napa cabbage. 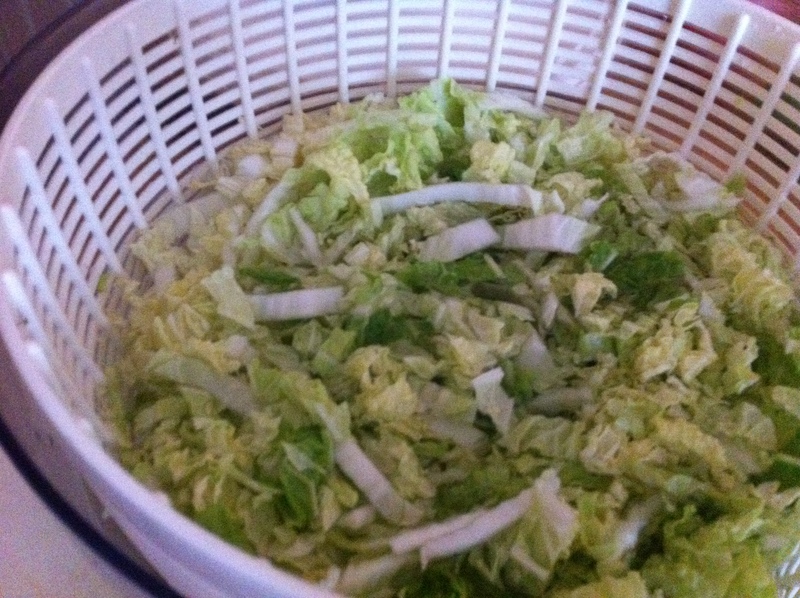 So here’s what I did with this mystery veg: I made a light summer slaw. I cut off the green so it resembled an apple, peeled. 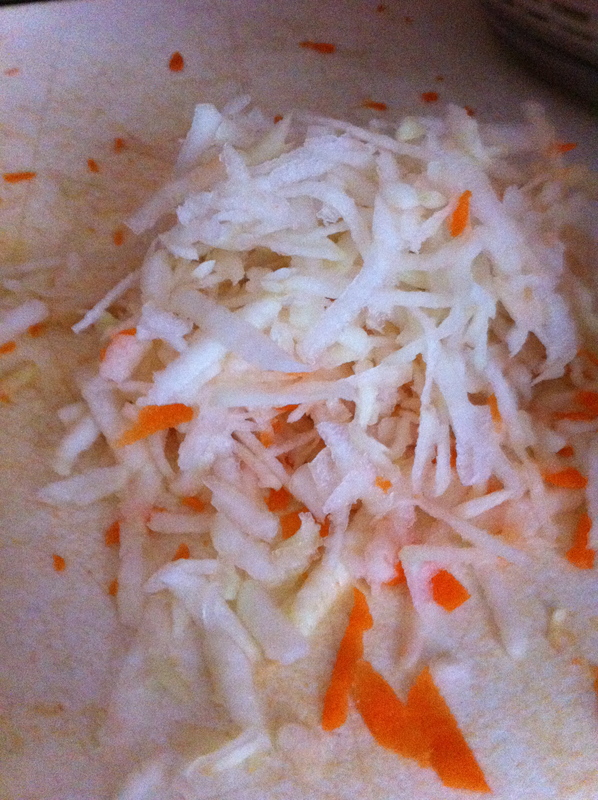 I shredded the cabbage, then I used a cheese grater (because I have a small kitchen and lack other more precious kitchen utensils, and frankly they’re expensive and not worth it) to grate three carrots, the three heads of kohlrabi, and one gala apple, peeled. I tossed them all together in a bowl with some freshly, thinly sliced scallion, and then I made a slaw dressing variation I think I already talked about here so forgive me for repetition but it was relevant in this case. 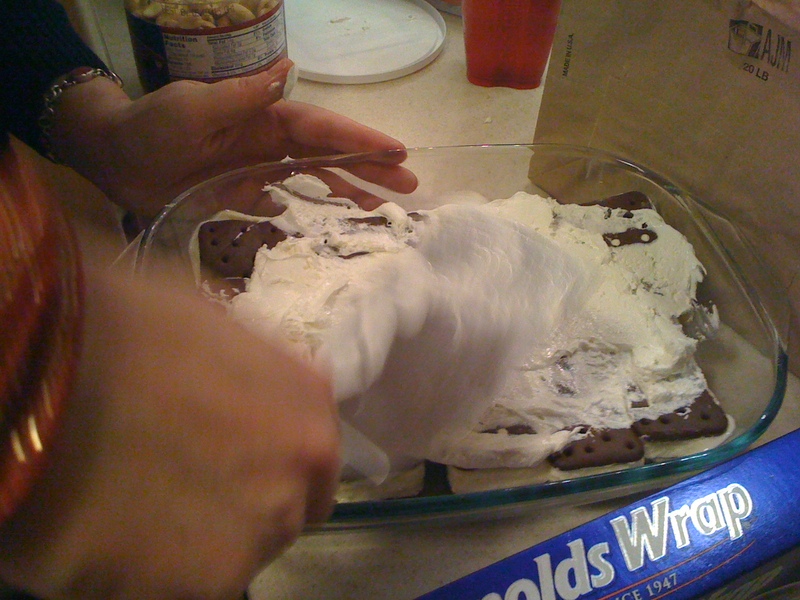 Whip with fork until creamy and sort of runny. 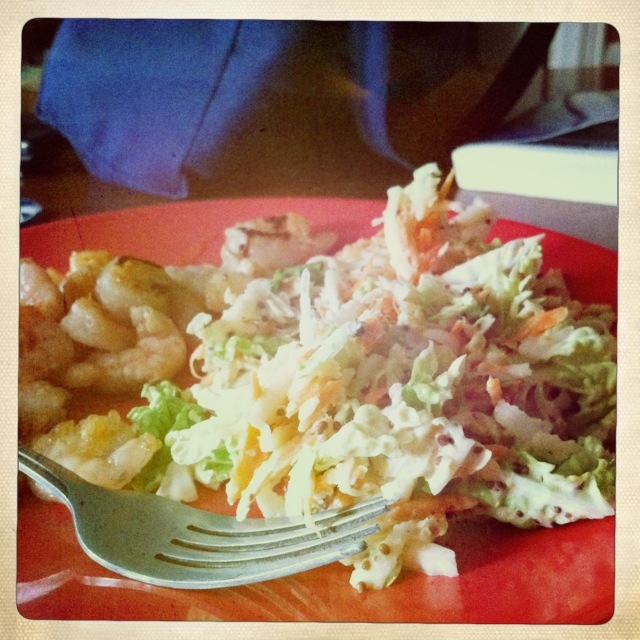 I tossed it over the mix and I had the most delightful, light, crisp slaw ever. I served it with sautéed shrimp. 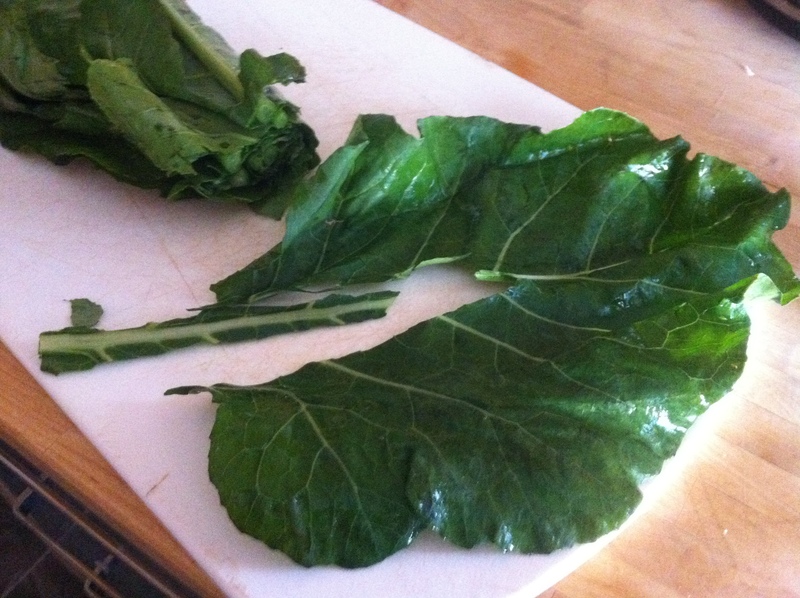 Oh, as an aside, we also at the leafy green tips, first steamed then sautéed with olive oil. They were hearty, sort of like an edible construction paper, maybe they’re not ideal as a leafy green, but they tasted good to me. So here’s to strange summer vegetables and summer in general, huh? I’m in a food rut. 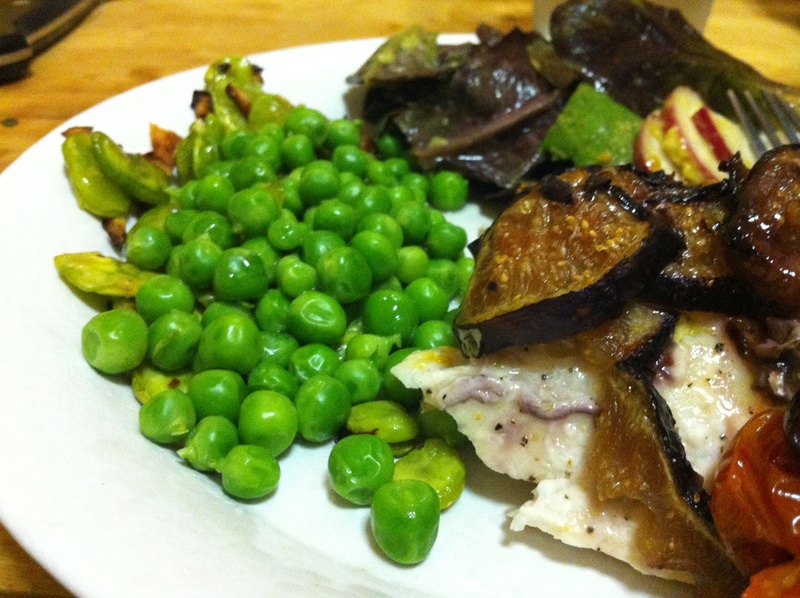 Lucky for me, it’s early spring and there are a host of vegetables I don’t often cook. 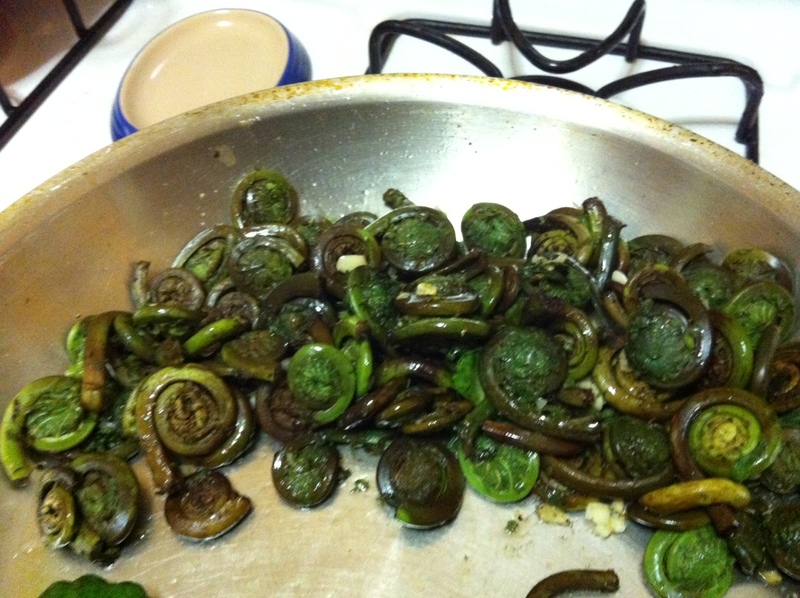 Fiddlehead ferns, for one. They’re the windy green stalks of a fern that haven’t yet grown. They’re high in iron, fibre and deliciousness as long as you’re not afraid of them. Mom says to steam them first, for a few minutes to soften them. I don’t have a double boiler so instead I just stick a strainer on top of a pot of boiling water, works just fine. I steamed them about five minutes. They got a little brown in color. Then, I added 2 cloves of minced garlic, salt, pepper and olive oil to a pan, and turned the heat on high, and sautéed them, adding about 1/4 a cup of chicken broth to soften further and add flavor. 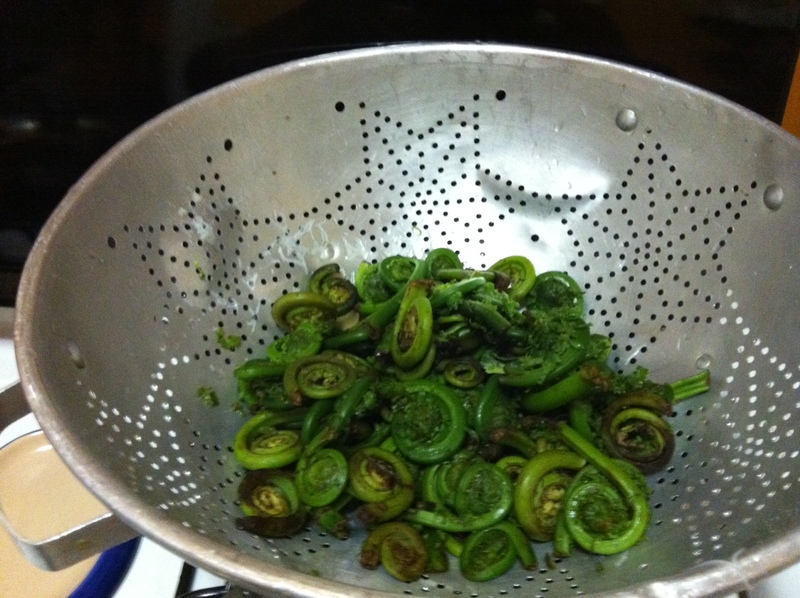 You can eat them alone, but I served them with patty-pan squash, which has a sweeter taste, to offset the bitter, earthiness of the ferns. I cooked the squash in the same mixture, just tossed them in first and then let the ferns cook. The squash took about 15 minutes, the ferns 10. They were still crunchy, which is how I like them. 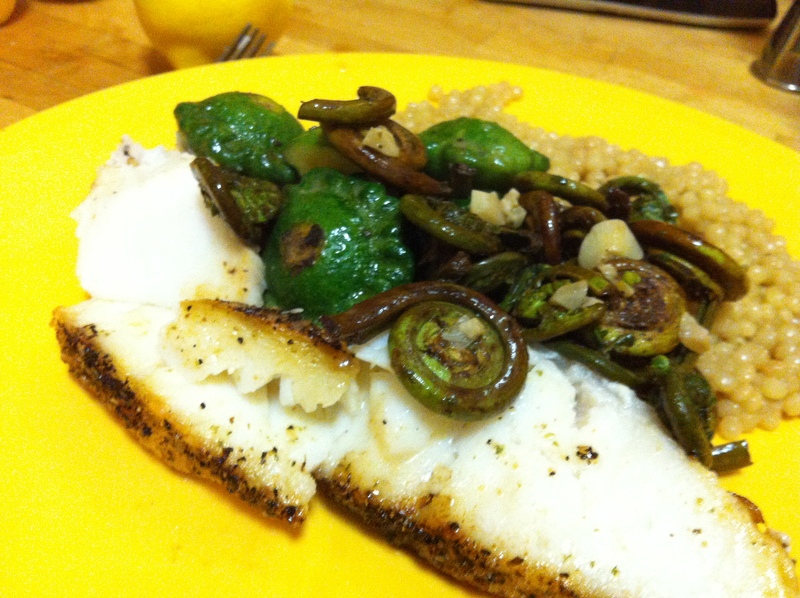 I served the vegetables with Israeli couscous and broiled sea bass. The whole meal took 35 minutes to cook. There are a few things that mom suggests everyone should have, if possible, in their kitchen. 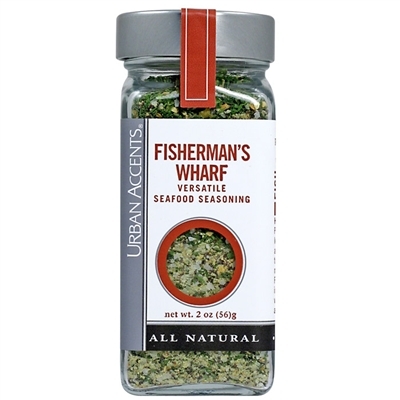 Today I’m talking about Fisherman’s Wharf from Urban accents. 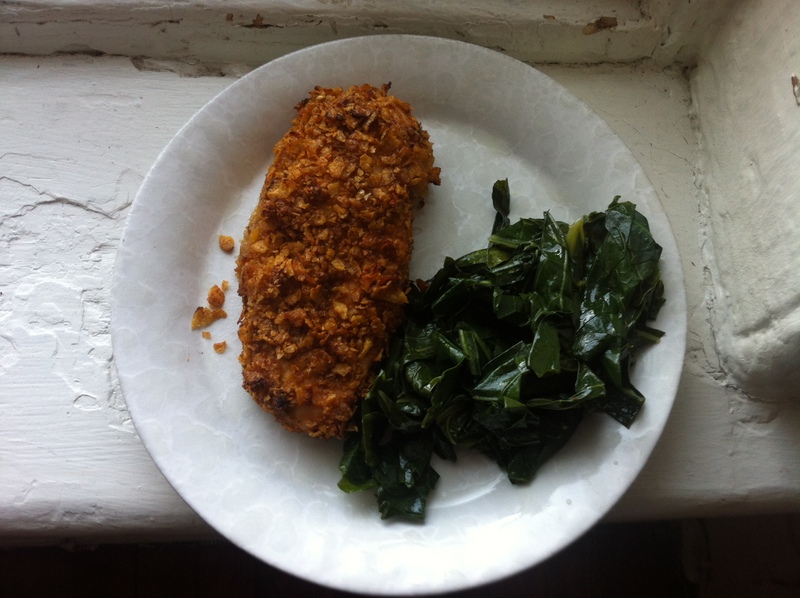 It’s a light, tangy blend of citrusy spices and is great sprinkled on boring fish dinners, like tilapia or salmon. Check out the Urban Accents site, or go to Dunning’s. After Christmas, some of my most favorite people on earth came to mom’s house for excellent and delicious spaghetti dinner (see how to make that here) and my aunt Paula, mom’s youngest sister, came over with this little ditty for dessert. I didn’t think I would bother saving room since I usually stuff my face with spaghetti sauce but there was no way I could resist. This needs to sit in the freezer about an hour, so be sure to plan for that. You will need: A package of plain, old fashioned ice cream sandwiches. 1 Package of Cool Whip. 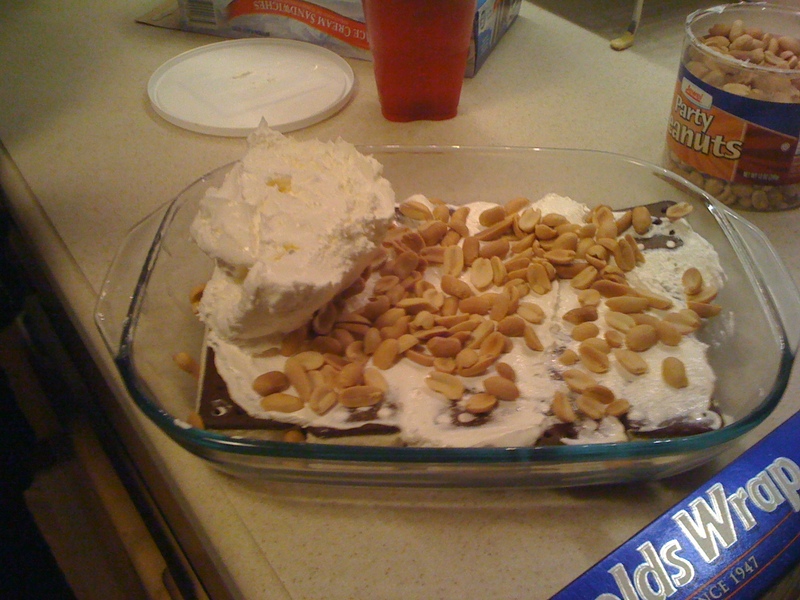 Then, add the fudge, caramel and peanuts. You will need to warm the sauces slightly to make them easier to spread but don’t overheat it or you’ll melt the whole lot. 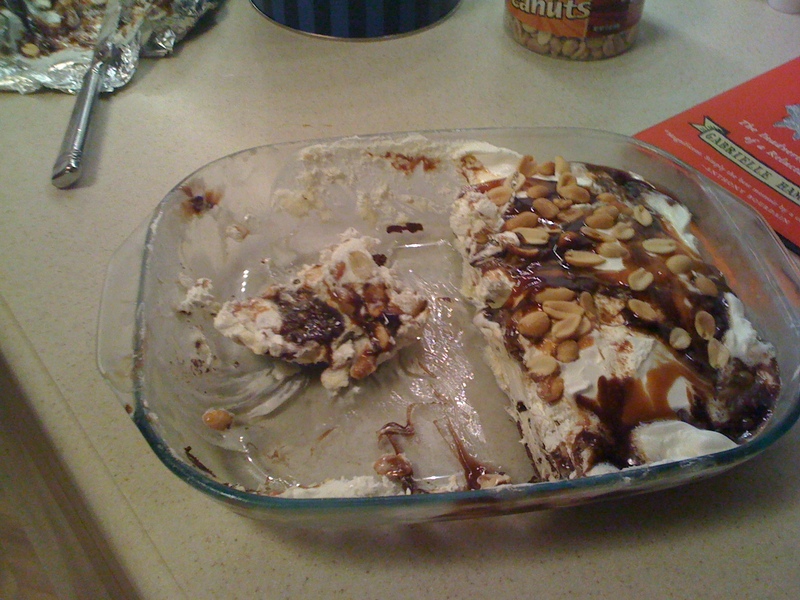 Add some more peanutst to the top layer and bit of chocolate sauce, then stick it in the freezer for a an hour or so. Slice it like ice cream cake. It’s like frozen Snickers. Nice work, Paula. My mom says all you really need when you’re buying kitchen gear is One Good Sharp Knife. The rest is just bells and whistles. I’ve never actually bought one for myself, though I now own two. Giving and/or receiving a knife is bad luck, or so the story goes. If a love gives you one, your relationship is about to end. If a friend does, it severs the ties. I am totally superstitious. I can’t help myself, I think it’s my Catholic upbringing and the Italians in my family. I don’t walk under ladders, I don’t break mirrors (fingers crossed). So when I got the newest one for Christmas from Andrew’s mother, I mailed her a penny in a thank-you note. The knife is beautiful: An 8-inch Wusthof Classic Icon knife, with a heavy handle and a beveled edge. 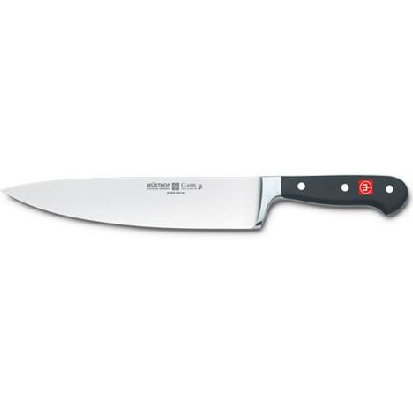 It’s so sharp it slices through tomatoes and doesn’t mush them, and could easily cut off my fingertip if I lost concentration julienneing vegetables. Anyhoo, if you give a penny, then technically you bought it, and it’s not a gift and no bad luck. It may sound nuts but I wasn’t taking any chances. The last time I got a knife as a gift it was about a decade a go, a generous surprise from a guy. That knife is 10-inches, also a Wusthof, also fantastic. I was thrilled, I was amazed, I was totally enamored of both guy and kitchen tool. But good grief the entire demise of our relationship can be traced back that damn gift. So beware of kitchen curses. Just sayin’.